Who cares how big your forearms are if they can't get the job done? 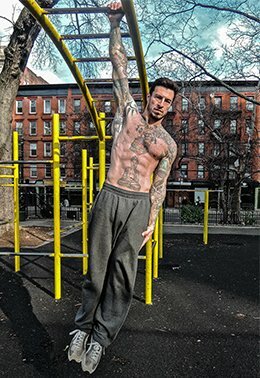 Build strength you can use with these five grip-building techniques! Have you ever walked into a gym and seen the biggest guy there strapping his wrists to the bar before deadlifting some impressive weight? How about the chap at the pull-up station whose lats boast a broad wingspan, but the dude can&apos;t perform the full range-of-motion without resorting to a set of narrow, padded, "ergonomic" handles? Both of these powerful individuals own grip strength—a fundamental aspect of human physiology—that is sub-par. It&apos;s been coddled, rendered weak when compared to the rest of a strong body. What a shame! You&apos;re only as strong as your grip, which must be powerful if you want to be powerful. Hands shouldn&apos;t be pampered with straps or soft, gummy padding. Rather, they are to be used to their maximum genetic capabilities, which are greater than you think. We are primates, after all. Newborn babies can grip before they can walk, crawl or even roll over. By the time we&apos;re grown up, we should all have forearms like Popeye, but many people&apos;s grip limits their strength rather than boosting it. Endless reps of wrist curls and hinged, squeezable grippers may seem like the answer, but although time-consuming, neither does much to improve grip strength or performance. Fear not! Time-tested methods exist that you don&apos;t see or hear much about in most commercial facilities. They&apos;re simple, they work, and you don&apos;t have to buy anything new to implement them. Now let&apos;s get strong where it counts! One excellent way to increase the grip requirement of basic exercises is to increase the bar thickness. You don&apos;t need to shell out for fancy Watson bars to make it happen, either. The first time I saw this principle applied in a gym setting, a trainer simply wrapped a barbell with a towel to make it thicker. The larger surface area demanded more from the hands and forearms, and a basic exercise like the bench press became even more effective. That&apos;s a solid start. "Try doing your pull-ups on thicker bars, or even off of jungle gyms or ledges." You can also apply the principles of thick bar training beyond the barbell. Try doing your pull-ups on thicker bars, or even off of jungle gyms or ledges. Swapping out skinny parallel bars for fat ones on other body-weight exercises, such as dips, can translate to monstrous gains in grip power as well. Get creative. Hanging from a bar challenges your grip muscles to support the entirety of your body weight, as opposed to just a fraction. That&apos;s why most commercial grippers will never be as good as hanging. Furthermore, because of the demand to the arms, shoulders, back, and core, hanging from the bar unlocks far more than just grip strength. It increases your raw upper-body power. Try it with one hand for an extra challenge, and pretty soon you&apos;ll be asking people "How long ya hang?" instead of "How much ya bench?" Even if you&apos;ve never done a muscle-up, working on slow negatives is a spectacular way to train your grip. I&apos;ll never forget the first time I did 10 slow negatives in one workout. I felt the burn in my forearms for days. A muscle-up is like an explosive pull-up in which you pull as high as possible to the bar and then extend your triceps, pressing the upper body up and over the bar. You can think of it as a pull-up combined with a straight bar dip. That top position is the starting point for the negative. The palms should face down into the bar, with the back of the hand toward the sky and the bar at around waist-height. When performing slow negative muscle-ups, it&apos;s OK to climb into the top position using a step, bench, or low bar. "You can think of it as a pull-up combined with a straight bar dip." From this position, lower yourself down into a hanging position as slowly as you can. Squeeze the bar tightly for the entirety of the exercise. Contract your abs and press your feet straight out in front of you, so they serve as a counterweight to your upper body. One of the keys to the negative muscle-up is the manipulation of leverage. This will help keep the movement slow. When starting out, it&apos;s not necessary—or usually even possible—to go for reps. Rather, focus on the process and work one rep at a time. Be as deliberate and controlled as you can, particularly as the body lowers down around the bar. Be prepared to be humbled. You may need more recovery time than you think! In grip training, we do a lot of grabbing and squeezing. In order to produce a grip forged from iron, it&apos;s important to counter that movement. Much how training a plank strengthens both the abdominals and low back muscles, fingertip push-ups will challenge your extensors—the muscles that open your fingers—in addition to the flexors, not to mention your tendons and other connective tissues. Especially when combined with the exercises mentioned above, fingertip push-ups will help produce balanced, powerful hands with tree-trunk forearms. Just get ready to work hard. Of course, other things in life can build superior gripping strength. Activities such as rock climbing, carrying odd-shaped objects, and climbing a rope can all contribute to monstrous gains. The world can be your playground here. Try things out and don&apos;t be afraid to experiment. It&apos;s important to work hard, whatever the conventions.